It’s not every day that life brings you face to face with a celebrity of the caliber of the ionic Ashaji’s fame. Hence Buzzingtales was transported to quiet another world at the prospect of meeting up with the living legend – Asha Bhosle. On 30th May 2015 bollywood’s all time singing sensation Asha Bhosle hosted a lunch and met with food bloggers and social media personnel’s at her celebrated Indian restaurant ASHA’s Original at Wafi Mall, Dubai – to mark the launch of the new Coastal Menu. Residents of Sheikhdom are unlikely to miss the architectural splendor of Wafi. Housed in it, is the illustrious Indian singer Asha Bhosle Ji’s pioneer Indian Restaurant of Asha’s Original. Asha’s Original’s inherent tradition of serving delicious authentic Indian cuisine stems from the owner’s love for cooking and serving good food.In Ashaji’s own words – “Cooking is a lot like singing. It brings joy and pleasure to my audience.” “Good food transcends any language or culture it has universal appeal.” Many of the signature dishes have been developed by Ashaji herself and from her culinary encounters gained through voracious travel across India. Meeting such an illustrious yet grounded personality, exuding so much warmth just takes ones breath away. She was her charming self – Patiently chatting up & posing for pictures with the guests/fans. Dressed demurely in a light blue & white saree with a string of beads she belied her age. Her warmth and flamboyance was reflected in the restaurant’s décor, service as well as cuisine. 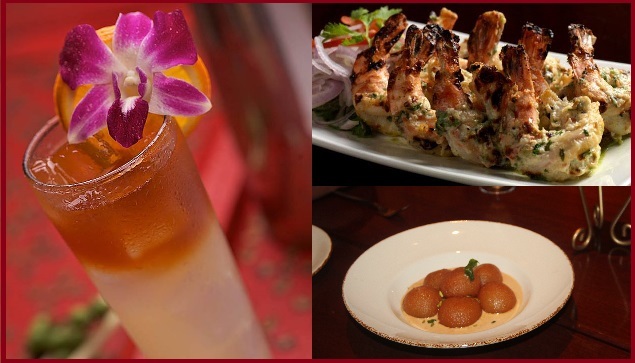 Asha’s Original offers scrumptious traditional Indian delicacies in a dynamic modern setting. During the winter Asha’s gorgeous terrace setting is an ideal place to enjoy your food as well as the stunning views of the Wafi courtyard. During the summer you can relax in the idyllic ambience inside the restaurant and catch a glimpse of some memorable moments from Ashaji’s life though the pictures adored in the walls. soothing alluring ambience head off to Asha’s Original at Wafi Mall.